Welcome to Russian DREVO School, a part of the Pacific Russian Language Association. Our school was established in 2013 and has been providing Russian language education for children and adults since that time. Children from the age of four to six attend the Pre-School Centre and are introduced to Russian speaking, reading and writing, numbers and elementary arithmetic operations, visual arts, music, and dancing. 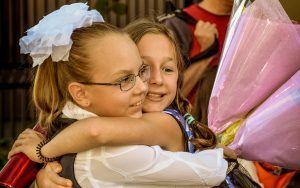 Elementary school students (Grade 1 – Grade 4) develop their skills in Russian speaking, reading, calligraphy, grammar, arts, and theatrical acting. In Grade 5 – Grade 8, our students use their knowledge of Russian to learn Ancient and Modern History, Creative Writing, Public Speaking, Mathematics and Calculus, Russian Literature, and Advanced Russian Language. We also offer an intensive Russian course designed for students and adults aiming to develop their Russian communication skills. Emphasis is placed on comprehension and oral expression. For information please call us at (604) 722-1392.